Conferences/banqueting (120/70); broadband wi/fi, business centre, secretarial services. Rooms 13 (1 suite, 4 executive, 3 family, 1 shower only). 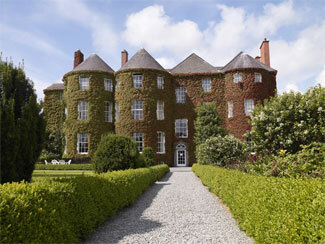 B&B €100pps, ss €40, sc discretionary. Children welcome (under 2s free in parents' room; cot available without charge, baby sitting arranged). Tea Room: breakfast 8am-10am. Afternoon Tea 2 pm-4pm, from €29pp (booking essential). Pantry: 11am-4pm. Parking (20). Walking, garden. No pets. Off-season breaks offered. Closed 24-29 Dec. Amex, Diners, MasterCard, Visa. 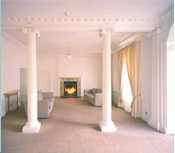 Located close to Kilkenny Castle, this elegant Georgian townhouse was restored by the Irish State Design Agency in the 1970s - resulting in a combination of what was at the time contemporary design with period architecture. 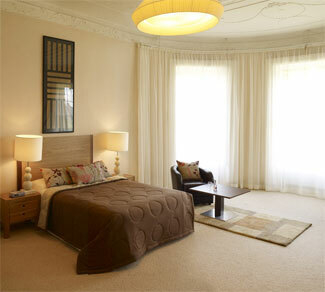 Unusually spacious bedrooms are a happy outcome of this redesign - some have bow windows overlooking the gardens and Kilkenny Castle - and, following recent refurbishment, the accommodation now has all the amenities expected of the best guesthouse accommodation, including upgraded bathrooms - most rooms now have full bath. Breakfast was previously served in the Kilkenny Design Centre across the gardens, which was no hardship, but daytime food including a classically indulgent Afternoon Tea and a wonderful breakfast is now available here at the elegantly appointed Butler House Tea Room & Pantry. Chef Gerard Dunne delights in showcasing local produce including, for breakfast, oatmeal from the Little Mill, butchers sausages made with Butlers Farm free range pork, eggs from Fanningstown House (baked with Goatsbridge smoked trout, cream and chives, perhaps) and Highbank Orchard syrup (delicious with Buttermilk Pancakes and crispy bacon), all served with homemade breads and preserves. Enjoyed in such lovely surroundings, it adds up to a lovely sense of place - and a memorable experience. 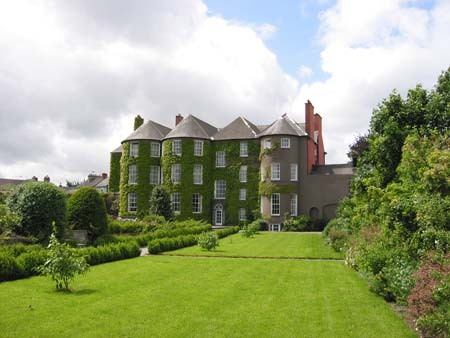 Butler House is also a perfect setting for small weddings and private events seating up for up to 70 guests in an exclusive garden view room overlooking the walled garden and the majestic Kilkenny Castle.